Podcasts are seeing an amazing resurgence in the last few years. I’ve been using them since I started working in 2015 as an alternative to music when working. As an architect, I’m often confronted with doing long stretches of work that affords me the opportunity to have something playing in the background without distracting me. I’ve found podcasts to be an excellent way to keep me going through the day, and to learn something new along the way. Serial a story told over multiple episodes; incredibly interesting true stories that keep you going throughout the day. Hello Internet chatter and random topics from two funny guys, one of whom makes some really interesting YouTube videos that first got me into the edu-space of YouTube. The Daily from the New York Times; the latest news delivered in an entertaining way. 99% Invisible a classy design-related podcast. Everything is Alive everyday objects brought to life. StarTalk Radio Neil deGrasse Tyson talking science. Need I say more? TED Radio Hour expanded stories from topics featured in TED talks. My Indian Life with Kalki Koechlin, from the BBC World Service. My podcast app of choice is Overcast for iOS; but there are plenty of other good apps, including the stock Podcasts app on most phones, that works just as well. It’s been well over a year since my last post. But slowly I am re-emerging from this writing hibernation and eager to get back behind the keyboard, behind my trusty Parker Jotter, and continue my rumination on the world, the built environment, technology, and, well, life in general. A lot has happened since my last post. I’ve completed my Masters in Architecture and am getting to grips with the ‘real world’. And I’ve come to realise that writing is a key tool in helping me navigate this new terrain. I am thinking of what Life in Pixels means to me now, at this point in my life and career. So there might be some changes… but I feel like this blog, being a personal repository of my writing and ideas, should remain exactly that. I admire the sagely writings of the Eastern prophets and thinkers – Lao Tzu, Confucius, Rumi; I believe that their ancient wisdom can help us navigate the complexity and clamour of our technologically driven world today. Whilst not a part of the aforementioned writers’ canon, there is a Zen concept that emerges from the meditative act of Japanese calligraphy: the beautiful, minimalist circles that are in themselves symbols of lucidity. It is called Ensō. Ensō is symbolic of staying in the present, detaching the mind from the body, where the body or spirit is free to create. It is, in a way, a record of the moment of pure creation. It is cyclic, it is honest, it is at once incredibly intricate and surprisingly simple, capturing the Moment in a single movement. This idea of the “moment” has always compelled me. Creative work is a difficult beast to tame, especially in this Age of Distraction. Being mindful, calming the mind, focussing on the pure act of just creating, is essential to being content, is essential in taming that seemingly unwieldy monster. I think Ensō is such a beautiful idea, it’s result so lucid, so pure and honest. It is a reminder to us busy souls of what it means to create and to centre oneself in this chaotic universe through the simple yet powerful act of conscious creation. Staying in the present, living in the moment and fading the world out so that it’s just you and the work to be created before yourself: this is Ensō. My life is made up of many facets – due, perhaps, to multiple interests that influence my daily living. In writing this post, I decided to distill those many interests into three main areas: writing, architecting, and coding. Those are my principle fields, the ones I choose to spend my time in contemplating things and creating things. I thought it’d be a fun exercise, both in practicing my vector drawing skills with Illustrator, and in collecting and thinking of the tools I use on a daily basis, to compile this post. These are items I depend on daily to get through my work; they are indispensable to who I am and the things I create. (I might add that my EarPods are a part of this mix, but didn’t make it to the final cut – maybe because I forget to carry them around with me sometimes). Music is a big part of my life. My trusy old iPod classic has been a longtime companion, but since I’ve become hooked on SoundCloud, I’ve been using it less. So now it’s mostly relegated to staying in my car, where it powers my driving soundtrack. My iPhone (and sometimes iPad) is the streaming surrogate for my SoundCloud obsession lately. I write a lot, and find that analogue writing is a great way to distill thoughts and slow things down. 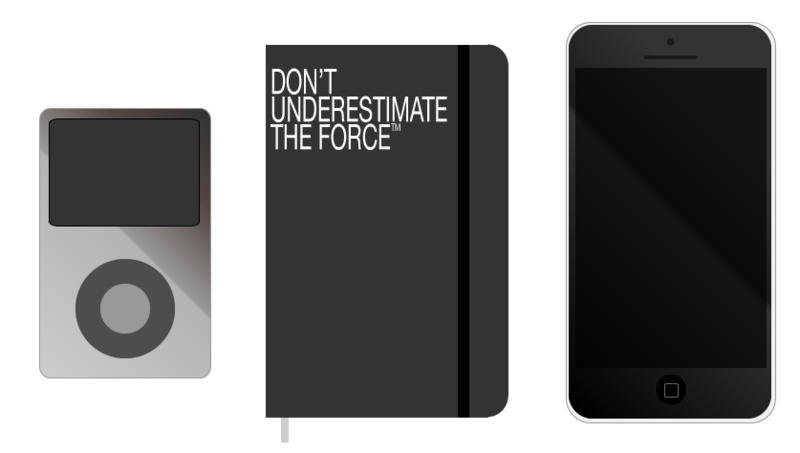 My latest Moleskine is the Star Wars “Darth Vadar” edition ruled book, with the inspiring words “Don’t Underestimate the Force” embossed on the cover. I mainly write with a fountain pen in it (a Parker Sonnet with Sheaffer Blue/Black ink, a gift in my final year at high school), but when on-the-go, my trusty Parker Jotter does the trick. I have a great affinity for the Jotter – it’s the only model I’ve ever used since I was in Grade 4, and I carry it with me wherever I go. As a designer, I keep a simple sketchbook with me for those moments when I need to sketch something to make sense of it. I’m not the best drawer, but little diagrams often help resolve some of the most complex problems, from graphic design ideas to large-scale buildings. My MacBook Pro is central to everything. It’s the machine I use to edit video, animate logos, design everything from wayfinding assets to website graphics to architectural projects for university, to writing blogs, short stories, essays and even my attempts at various novels. Everything I do feeds into this wonderful, dare I say it – magical, machine. Having an iPad Air helps tremendously as a second screen to display concepts or PDFs with tutorials, books or even web pages I’m using for reference. This allows me to keep the MacBook’s screen devoted to the task at hand. I generally run OS X with three desktop spaces to lessen the clutter that can arise from having many windows open at once. I always maintain that it’s not the tools one uses, but how they use them, that should be important whenever art is concerned. But this setup is what makes me enjoy creating things, imagining things and bringing things to life. I’ll probably change many of these elements as the years go by, but for now I’m really happy with this workflow. What should a human being do? Specialization is, indeed, for insects.